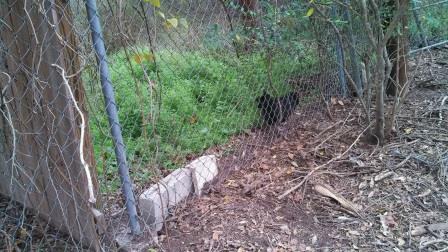 This morning, as I was filling the chicken waterer, I looked up and saw one of our black chickens in the neighbor’s yard. I must confess I can’t blame her. The grass was definitely greener on the other side of the fence. Unfortunately, her desire to be with her flock won over her desire for greener grass. She paced back and forth trying to figure out how to get back over the fence. Since catching chickens is a frequent event at Miller Farm, my husband devised a “chicken getter” stick. It is a wire hanger with a hook at one end with which you can grab the chickens feet and lift them off the ground. Chickens become quite calm when hanging upside down so you are then able to hold the chicken and take it wherever you need it to go. If “chicken getting” were an Olympic event, our Rachel would be a gold medalist. The day before, she had grabbed three bantams from the yard to sell to another chicken lover. I figured I could just reach over the fence with the “chicken grabber” and get the chicken back where she belonged. I wouldn’t have to walk all the way around and into the neighbor’s back yard. I soon discovered I am not as adept at grabbing chickens as Rachel. I blame my inability to catch the hen on having to reach over the fence. After several attempts, I gave up and headed next door. I may not be able to use a “chicken getter,” but my own two hands work quite well. I soon had an armful of chicken, which I promptly dumped back over the fence. Everyone was where he or she belonged, and we all went on with our day. Thanks for stopping by, Connie. I wish I could convince Sara to start a blog on her own. We get great responses when she blogs on Fridays. Sounds like our yard from all the deer traffic! For the last few mornings I have looked out the window to see a cow standing in our backyard. Could I borrow Rachel tomorrow? She’d love to help out and she’d bring the ‘chicken getter.” You think that’d work?